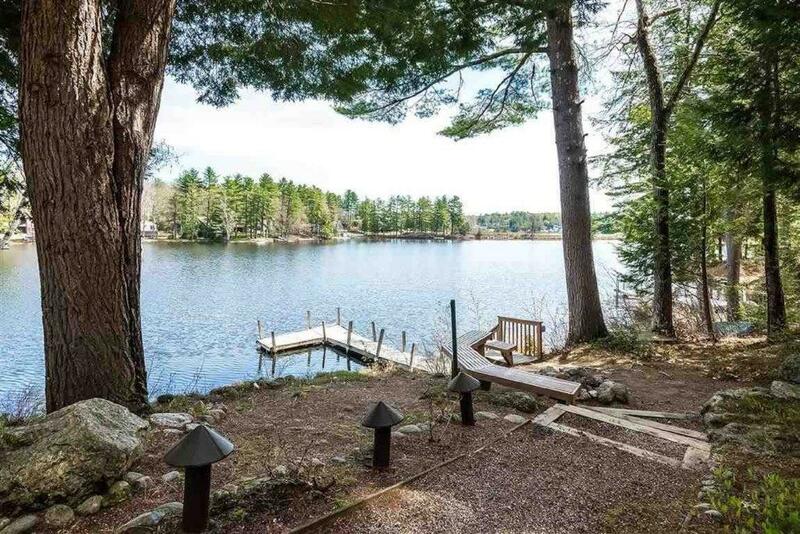 Winnipesaukee Waterfront: This lovely home rests on a pretty lot situated on peaceful Pickerel Cove of Lake Winnipesaukee. 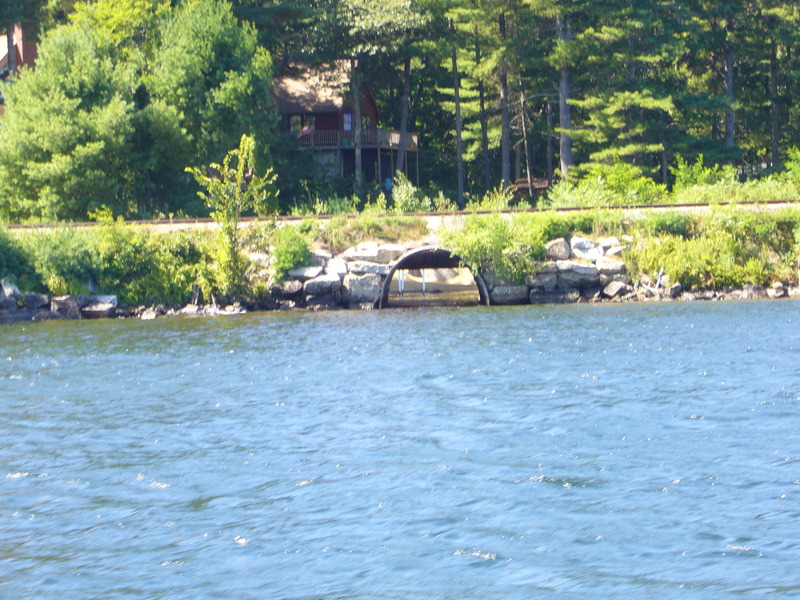 Access to Pickerel Cove via boat from Winnipesaukee is through a "tube" which goes under the Winnipesaukee Scenic Railroad tracks from Paugus Bay. Boat size is limited (see photo) to 16 feet. The home offers a lower level with laundry room and great 3-season room and separate sitting room for relaxing and enjoying the lake views. Up one floor you will find the living area along with 2 bedrooms and a full bath. Again, great views can be found on this floor from the wall of glass in the living area. The third floor gives you the master suite with full bath featuring a jazuzzi tub and shower stall; an office and a sitting area in the loft overlooking the living area out to the lake. The shore-front boasts a dock for your small boat and 2 single person kayaks for exploring the shoreline and maybe even catching dinner (water around this property has some vegetation - lily pads, etc). A gas grill makes for cooking while still enjoying your surroundings and the deck offers a great place to take an afternoon nap or read that book everyone's been talking about. Weirs Beach is just a short drive away (1 & 1/2 miles) if you are up for a day at the beach, a game of mini-golf or just a walk down the boardwalk followed by an ice cream cone. Not to mention some great restaurants! Take a short drive to Gunstock Mountain and ride the Zip-line down from the summit or, even closer, is Funspot - the world's largest arcade featuring the Monkey Trunks rope course. The picturesque town of Meredith is just a 15 minute drive away for an evening stroll to check out some great little shops. Come spend a great vacation relaxing or being adventurous - the choice is yours! The woodstove in the living room is off limits. Bike Week: $2,300. Weeks prior to June 9 and after Labor Day: $1,925. If you would like to rent linens, the fee for this property is $75 for sheets and $12 per person for towels. If you would like to have the beds made for you, the fee is $8 per bed. Rooms First Floor: Laundry Room and 3 Season Room. Second Floor: Kitchen, Living and Dining Room and Full Bath plus 2 bedrooms (Queen & Bunk & Twin). Third Floor: Master Bedroom (King) and Full Bath with Jacuzzi Tub and Shower Stall, Office & Sitting Area. "This home was clean and beautiful. My only issue was that there was no air conditioning at all and it was an extremely hot and humid week. Also, the cove is not swim-able for people who don't like lily pads and lake grass. It is pretty loaded with it. Other than that, it had everything you would need. " "The best, The house is a top class home , this is the 2nd year we have stayed there. I look forward to staying there again in 2019 ." "The house is beautiful and comfortable and sits on the lake. We had the most relaxing week in the property and enjoyed the small towns in the surrounding areas. Also close enough for a day trip to Maine and Boston." "Just as advertised. Everything was clean and up to date. Very peaceful right on the water, would stay again." "We stayed here in late July 2017, the house does NOT have air conditioning but lucky for us it was a cool week! We actually only used a fan the first night and then it was very comfortable and cool with all the windows open. The house itself is in great shape and is quite nice! More than enough room and the kitchen was well stocked with dishes & pans etc. The master bedroom was huge with massive closets and the king size bed was extremely comfortable! The other bedrooms were great as well! I would have to say the only downside to this property was the very murky water! I think because it's in a cove off the bay the water doesn't move therefore pretty uninviting not to mention there was no ladder on the dock to get back up out of the water! The location was awesome, close to weir's Beach and the boardwalk. Over all I would recommend this to anyone looking for a clean, quiet & comfortable place to stay! " "We had a wonderful week in this lovely home. The house was equipped with everything you need to be comfortable, including the use of 2 kayaks. The view of the cove from inside the house is gorgeous. We spent many happy hours just sitting on the many decks or on the dock or kayaking. The surrounding areas has many good restaurants, a train ride, boat rides on Lake Winnipausakee, shopping, and swimming areas. Would absolutely return to this house again!!" "The house is well-maintained and situated beautifully on a cove. One can't swim but there are kayaks and beaches nearby. The bedrooms are good size. Kitchen is well-equipped. Living spaces have wonderful views onto the cove." 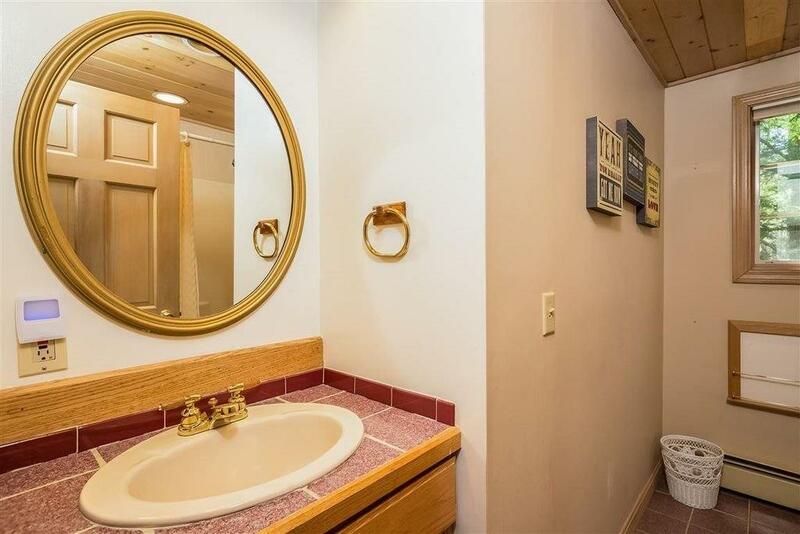 "We liked our vacation rental very much. House was clean, spacious and well maintained. Property description was accurate. 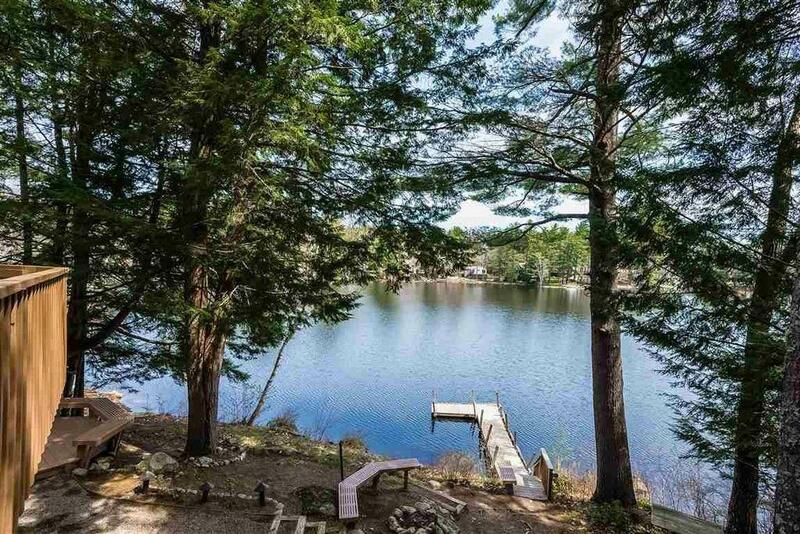 We would definitely recommend this property to anyone who loves lake vacationing. We were there for Laconia Bike Week and enjoyed our time in New Hampshire. " "Stunning home! Far exceeded our expectations. The owners did a phenomenal job building/renovating and maintaining the home. Rental company also did a good job describing the property and location on the cove. We would highly recommend this property. " "We had a great week! The location was very quiet. We fished off the dock and caught a lot of fish and a variety of fish (catch and release). The cove was a peaceful place to kayak with the option to go into the larger lake. The home was the perfect size for the 4 (adults) of us, 6 would have been comfortable too. "